The folks who make it to the tree via the path-rod fall down. Its exhausting. This seems so significant, and seems to confirm my earlier reading of the path-rod as not the optimal means of getting to the tree; we ought not kid ourselves about the cost of this route. Likewise, there seems to be a significant contrast between the difficulties of the path-rod and the difficulties making the tree via revelation. It’s a difficult journey no matter how one gets there—but Nephi’s gloss here highlights the danger of exalting the path-rod, or mistaking mere means as ends. Overall we’re being keyed in to two prominent mistakes—the one made by those who leave the path to wander in darkness, and another made by those who stay but mistake the path for the destination. There’s another great contrast here, concerning our initial steps and desires: those who begin to make their way toward the tree vs. those who begin to make their way toward the great and spacious building. I can’t help but think of Terryl Givens’ frequent comments that intellectually (and I would add, culturally) there is always good reason to elect Zion and there is always good reason to elect the world. This is mortality. What we intentionally elect, upon consideration, is a shining manifestation of our personal values. We also see here that merely making a choice and beginning down a path does not bring us to a destination, and this is just as true of those who proceed toward the Building as those who proceed toward the Tree. Note that there are those who wander in strange paths and are lost from view. We don’t know what happens to them, what their final destination is, what else is out there that they discover or what motivates them. What’s clear is that neither the Building nor the Tree ultimately draw them. Perhaps this maps onto the telestial, terrestrial, and celestial. In contrast to the tree, we don’t hear about anyone in the Building becoming ashamed and leaving. Life, on the other hand, shows us that this is often the case. Arriving at our destination is not ultimately arriving. The journey continues. Even endurance is either progression or degradation, depending on where one endures. We don’t know about Laman & Lemuel. Were they among those who wandered in strange paths? This would fit with the indeterminate description and worry that Lehi expresses. By contrast, Nephi is writing the narrative to show that the undisputed prophet/patriarch/leader Lehi saw (prophetically and early on) that Laman & Lemuel wouldn’t make it. But what really happened in the vision and what really happened in that family council? Two possibilities: one, while Lehi felt some concern, and so dedicated a special meeting to exhorting his sons, he didn’t feel anything like the anxiety Nephi portrays. After all, they didn’t go to the building; again, maybe they wandered in terrestrial paths and were lost from view—a very indeterminate prophecy that leaves multiple possibilities for the future. Or second, perhaps the dream was much more determinate and with a negative ending for the two, but Lehi, as a loving parent, couldn’t lose hope and doesn’t describe what ultimately happened in the dream so as not to close off possibilities or psychologically prejudice the family or forsake the possibility of redemption. Regardless, I’m once again struck by the contrasts between Lehi, the loving tender parent, and the narrative that Nephi is writing. 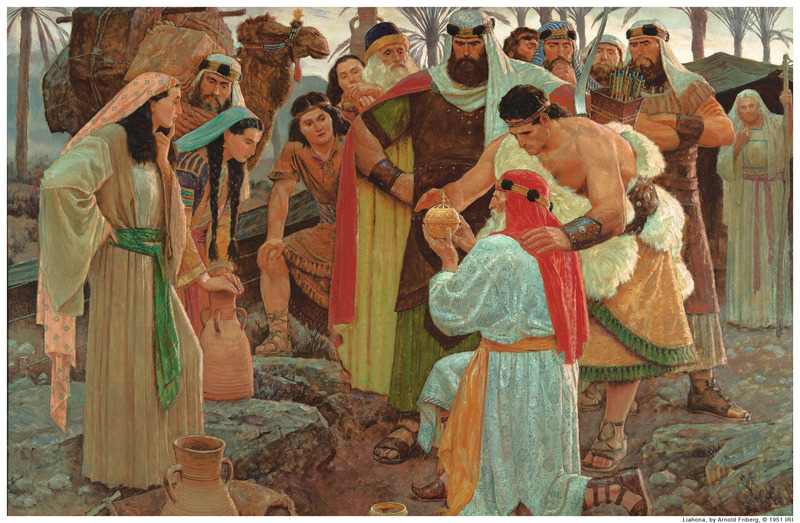 Nephi acknowledges that Lehi said a great deal, far more than is recorded. Nephi intentionally chose to focus on only one aspect of Lehi’s message: that Laman and Lemuel were in trouble and Lehi tried to exhort them. Nevertheless, something of Lehi shines through Nephi’s carefully crafted details. Lehi spoke with all the feeling of a tender parent. No tender parent offers mere reproof to their wayward children. There was much else that was said. I hope that my own heart and parenting take note. Finally, however, a father has said all that a father can say. The children must now make their own way. In addition to silence, however, this father left his children with commandments to guide their agency. I yearn for the voice of God, and shrink in fear from the silence. But even though I live in silence, I acknowledge the tender, parental love of commandments. “What more can he say than to you he hath said, who unto the Savior for refuge have fled?” This too is mortality. This is a very thoughtful post, James, thanks for sparking several new ideas for me. I particularly liked pointing out that it is wrong to mistake the path for the destination. I think the path is important, but not so important we forget why we’re on it or where we’re going.